Abu Dhabi: A few people protesting against the Sabarimala Supreme Court verdict on the streets do not represent public opinion, Pinarayi Vijayan, Kerala’s chief minister, told Gulf News in an exclusive interview in the capital on Wednesday evening. “You should not be misled by 10 or 20 people who pose in front of the [visual] media. They don’t represent the public opinion,” he said at Dusit Thani Hotel. The majority of people in Kerala stand by the state government’s view on this issue. “They strongly believe that ideas of renaissance and social reforms, and values of secularism should not be hurt. They are the majority. Others are low in number,” Vijayan said. “This is an unfortunate situation. The incidents in Kerala are deliberately orchestrated by the RSS [Rashtriya Swayamsevak Sangh] and BJP [Bharatiya Janata Party] that rule the nation. They are challenging the Supreme Court verdict that nullified certain provision of law, which was unconstitutional,” the chief minister said. He said the government will exercise its constitutional duty to implement the Supreme Court (SC) verdict. “After the SC verdict, some forces are deliberately attempting to disrupt the peaceful environment and the law and order in the state. The devotees of Lord Ayyappa [the deity at Sabarimala] cannot be blamed for this situation. They are going for praying to Lord Ayyappa. They will not face any problems,” Vijayan said. He said it is the state government’s legal duty to offer the pilgrims protection and facilities. “The government will exercise that duty. Some people are obstructing and attacking the devotees, and policemen who protect the devotees at Sabarimala. The common people will not agree with these evil acts,” the chief minister said. 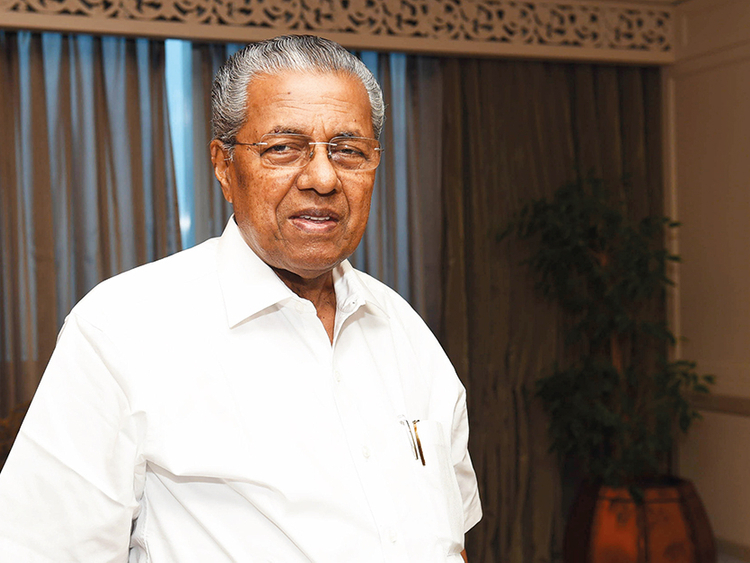 Pinarayi Vijayan has urged Keralite business-owners in the UAE to encourage their employees to take up ‘salary challenge’ to support the flood-hit state’s reconstruction. “Motivated by the employers [private businesses] many employees have come forward to donate their one month’s salary [as requested by the chief minister]. You can also inspire your employees to be part of this [campaign] ,” he said while addressing a dinner meeting organised by the Indian Business and Professional Group [IBPG] in Abu Dhabi on Wednesday evening. However, he clarified that the managements should not use their authority to compel their employees for this purpose. “Those who can contribute a small amount, let them do so; there is no compulsion,” Vijayan said. He had requested Keralites working in the state and across the globe to contribute their one month’s income in ten monthly instalments to the Chief Minister’s Disaster Relief Fund (CDRF). Even most of the government employees came forward to accept the ‘salary challenge, the chief minister said. He also urged the businesses to utilise the crowd funding portal (www.rebuild.kerala.gov.in) launched by the state government to support the reconstruction. B.R Shetty, chairman of the IBPG, said the Indian Business community in the UAE would always be there to support Kerala people. M.A Yousuf Ali, Vice Chairman of IBPG, urged Non-Resident Indians (NRIs) , especially Keralites, to extend their all possible support for the reconstruction of the state. Y. Sudhir Kumar Shetty, president of the IBPG executive committee, while welcoming the guests to the gathering, said it the group’s privilege to host the Kerala Chief Minister.